When watching the Tour de France it is impossible to miss the huge convoy of cars, trucks and motorcycles that accompany the racers. The Caravan with the riders has a very specific set of jobs and it looks a little confusing. Having spent many years in the caravan in the Tour and other races, I thought a little peak behind the curtain might help in understanding what is going on back there. In this article I sort out the caravan for you and hopefully it will make watching the Tour, or any road race, that much better. The Tour is the biggest circus in the land. 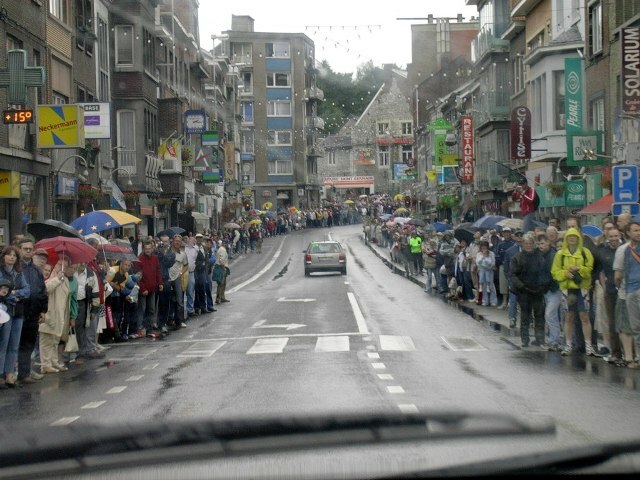 The Tour de France issues about 4500 vehicle permits for the race each year. Not all of these are in the caravan with the racers, but it's quite a number for a “green” sport. These permits even include a couple tanker trucks to refuel the three VIP helicopters, reserved for the big name sponsors and their guests. The UCI, the governing body of cycling, has a blue-print for the race caravan that must be followed. The race organizer is allowed minimum input to adjust for local needs and changes for promotion, but generally the UCI format is what's normally deployed. The Caravan is essentially split into two groups: the caravan in front of the peloton and the one behind. The procession up front is primarily there to secure the course for rider safety. It also handles breakaways and chase groups as they form. It consists of a flotilla of police cars and motos, a couple Officials cars, a neutral service vehicle (or two), a myriad of press cars, and VIP vehicles. 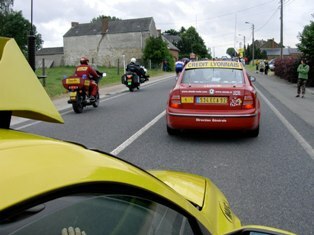 The traffic jam behind the peloton consists of all of the other support vehicles. There are two team cars per team (in a repeated duplicate caravan), race officials, a medical car and an ambulance, more press and VIP cars, a swarm of motos that include press, TV and photo, radio tour info, a caravan director, a time board giving the riders up to the minute information on breakaways and splits, and last but not least several neutral service vehicles. In the ProTour and other top-level events every team gets two cars, while in most continental level races and below, each team gets one. When the race rolls off, the front caravan moves ahead a couple of minutes in advance. It is under the direction of Commissar 2, the race official second in command and the one who will monitor the racing in the breakaways as they occur. Next, the peloton gets underway, and just behind is the fleet of vehicles in tow. They are under the direction of the “President of the Jury” or Commissar 1 and the race director who is normally the race organizer. In the Tour this is Christian Prudhomme . 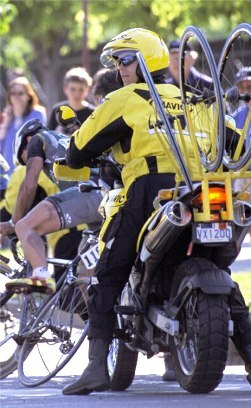 He runs the race while the UCI Chief is the referee and rules maker. The Team cars meanwhile are there to provide feed, mechanical assistance and tactical direction to the riders as needed. They may, upon request to the Chief, come to the back of the peloton and hand up bottles to the riders after a rider request has been made. The caravan always drives on the right, keeping the left clear for cars and motos moving up. After a service or a feed, a team car moves to the far right to slide back to its position. If a rider punctures or has a mechanical, the team car normally charges up the left, cuts across the medical car and services his rider on the right hand side. Typically, the team car will linger to be sure that their rider is underway. The rules dictate that a rider can use the cars in the caravan and draft his way back up to the peloton. 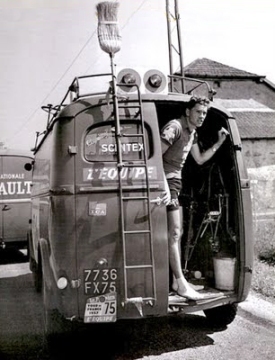 With a long caravan like the one in the Tour, riders usually have little trouble getting back on. Occasionally when there is a prolonged stop and the caravan has all passed, due to a bike swap or a significant mechanical, team directors will go outside of the rules and draft, “Speed bottle” or conduct a fake adjustment out the car window at speed to haul their rider back to the group. They risk up to a 300 Swiss Franc fine if they are caught, but in the big picture it is worth it. All of this makes the caravan a pretty treacherous place. Especially with a big peloton, the presence of many riders in the caravan at once is commonplace. Maintaining caravan discipline is a huge undertaking and a major responsibility. While race officials are constantly watching out that vehicles are in their assigned position and not providing pacing, towing or other unfair advantages, it is safety that is of primary concern. With the race often moving at high speed (especially down mountains) and team cars moving back and forth to support riders, it can get chaotic very rapidly. Often, very difficult conditions dictate the need for nerves of steel to deal with car rally type situations. Skimming the side of the road, especially in high mountains, takes years off of your life. Narrow mountain passes, wet or dusty roads, cobbles, strong winds, heavy rain and even snow (early spring and high in the mountains) all contribute to the reality of working in the Caravan. Sadly the Tour has seen spectators killed by Caravan vehicles. The last was in 2000 when a young child was struck by a publicity vehicle that had moved to the side of the road to make way for a team car. While rider support may be ‘job number one’ for the Caravan, the ever present corridor of humanity lining the roads is always the most serious concern for every vehicle driver. So what is up with Mavic neutral service cars? With so many support cars why are they needed and how does it work? In the old days of road racing, every time there was a breakaway or a chase that gained a few dozen seconds, the team cars would do the dangerous job of passing the peloton and go forward to support their riders, then come back again to take care of the main group. This was mighty dangerous as it was occurring many, many times each race day. Imagine a break of ten with one rider each from ten teams. Ten cars moving constantly up and back. Yikes! In 1973 the then President of Mavic, Bruno Gormand, suggested one “neutral” car to service all the riders with no allegiance to any. They tried it at Paris-Nice in ’73 and it worked well. It has been used ever since. So when a breakaway gets a steady gap of 50+ seconds, a neutral service car is dropped in from the front caravan. If there are neutral motorcycles, usually reserved for mountain days, they can go into a gap of 30+ seconds. You will see the Commissar 2 car drop in normally when the gap has grown to around 1 minute 30 seconds. As the races progresses and the gap grows to a safe and solid distance, the race director will allow the extra team car to come up the road and support the break. That’s why the big races have two team cars. When the gap comes down and the break about to be caught, they will pull the neutral service at about 30 seconds. That is a sure signal to the riders and the fans that the game is about to change. All of the vehicles in the caravan listen to race radio, or ‘radio tour’. Here the race situation, any caravan direction and other instructions are given to the teams and the caravan. All of the teams at the ProTour level maintain radio contact with their riders with two way radios ( this practice is now banned at lower category races). There are many surviving traditions at the Tour de France that originated during the very first races. First introduced in 1910, the Voiture balai (Broom Wagon or Sag Wagon in English) is without doubt the most hated vehicle in the Caravan by the riders. The Voiture balai, with a broom attached to the rear of the vehicle is normally the very last vehicle of the entire race caravan. At the Tour this can mean that it is not unusual to be an hour (or much further) behind the head of the race. The job of this vehicle is to literally sweep up any riders who are so exhausted or injured to ride on any further. Like a predator stalking it’s prey, the presence of this vehicle will push riders beyond their limits in order to survive another day in the race. Having the broom wagon following you is one of the most demoralizing experiences for any racer. In modern road racing the caravan support is crucial. Races have been won and lost by well placed (or not so well placed) team cars and materiel. Every rider’s fear is that of a puncture with 20k to go and no team car in sight. So hopefully as you watch a Tour unfold or other major race unfold, this little overview of the caravan theatrics will provide a good insight to what’s going on behind the curtain.